Home > Football > Lonely Chiefs fan, looking for his tribe, will travel. Have you ever been out of state or even out of the country and you run into someone you know from your hometown? It’s always a feeling of, “Heyyy! What are you doing here?! This is so crazy!” To be so far away from home and yet you run into someone you know is pretty random, rare, but it’s also a great surprise too. This is how I feel being a Kansas City Chiefs fan living in Miami, FL. The sad thing is, I’ve only had SEVEN live and up-close interactions with other Chiefs fans in 25 years! You know how difficult that is? Being so passionate and in love with a team and you’ve only met SEVEN people in your life who share the same love you do live and up close?! It’s like being stuck on a deserted island and only 7 times in 25 years do you make contact with another civilian with whom to be able to converse with. Sheesh! When I was a kid, Joe Montana was easily my favorite player growing up. Not just because I loved Joe Montana football for Sega Genesis but because I was also a huge fan of him on the field. Something about his style of play captivated me and easily made him “my guy.” Truth is, I wasn’t a 49ers fan at all. In my early childhood years, I was a Big Blue New York Giants fan, thanks to my pops. That’s his team, so I was born into the Big Blue fanhood because of him. Heck, I was even part of a South Florida New York Giants fan club! Fast forward to 1993, the trade that sent Joe Montana to Kansas City changed EVERYTHING for me. Looking back, I honestly knew very little about the Chiefs. It’s not like I could go online, open an app, or watch the NFL ticket to know about this team. All I cared about was, “If Joe is going there, I like this team and I’m sticking with them.” Twenty-five years later, I’m still a fan and the Chiefs take up a good part of not only my closet but also my heart. Yet, I’ve only had seven encounters with a live and up close Chiefs fan. I was at Miami Metro Zoo, I’d say around 11-12 years old at the time and I saw a car with a Kansas City Chiefs flag. I was shocked, confused and stunned all at once. I was walking by the employee section and I remember feeling as if I just wanted to wait there for this individual to come out! I remember leaving the Zoo hours later and wouldn’t you know it, the car with the flag was driving by me! All I could do was wave like a crazy kid seeing their favorite celebrity drive by but they didn’t notice me at all! At least I was able to actually see a live Chiefs fan, right? While working at Best Buy around 2005, a new employee emerged out of nowhere. His name was Chris too and he knew his sports stuff so naturally, we clicked automatically. It was the offseason in football so there was no football talk throughout our sports talk, just a whole lot basketball conversations but then came that moment. I asked, “Who’s your favorite football team by the way?” His response, “Them Chiefs.” I was like “Wait what!? Did you say Chiefs? As in Kansas City?”Sure enough, he was a Chiefs fan! Instant connection of course.. I want to say I gave him an immediate bro hug and a firm handshake like if I had just found an old family member. Unfortunately, we lost contact and my only Chiefs friend ever at the time was gone into the wind. While working at Chik- Fil-a around 2014, same situation as the other Chris, a new employee emerged. In the kitchen, the main two questions to any new male employee after the name exchange was, “You watch sports? Who are your favorite teams?” I remember being in the food line and coming to a pause when my man Devante said, “Kansas City Chiefs.” I paused and froze. There was a brief moment of silence in the kitchen as everyone else knew, “Oh man, Chris found a new best friend!” I was so shocked that I was in disbelief. I was like, “Wait, like a for real fan?” Not sure if anyone has done this when meeting another fan of your team, but you start up a questionnaire like an evaluation to test their level of fanhood. Yeah, that was me. I was peppering him with a few questions only a Chiefs fan would know. After asking about depth at positions, coaches and what not, he checked all the boxes! Yes!! A KC fan at last! Seemed like a few months after, DeVante found another job and left, we lost contact and again, I lost a Chiefs friend. It was a day after a crazy night game with the Chiefs and their division rival Denver Broncos. This was back in 2016, where the Broncos missed a field goal at the end of the game and the Chiefs ended up winning. It was one of the most insane games I’ve experienced as a KC fan. The very next day, of course, I’m struttin’ around Miami in my Chiefs shirt and while I’m at Walmart I hear someone say, “Nice shirt.” Confused and not sure if it was directed at me, I looked around and wouldn’t ya know it, there was an old man wearing a yellow Kansas City Chiefs hat. When we made eye contact he pointed to his hat and said, “Hell of a game last night, right?” I said, “Yeah! !” Not simply because it absolutely was a hell of a game, but also because it was a Chiefs fan live, and in the flesh!! I immediately went over, shook his hand and gave him a hug. He probably thought I was really hyped over the game, which I was, but also was pumped to see a KC fan! It was a Sunday morning, pre-game time, and I was going to watch a 1 PM Chiefs game at my dad’s house. I usually watch the games either at his house, or my cousin’s house (they are the ones with the NFL Ticket). My dad was in the mood for some Cuban coffee and pastries so we headed over to a spot nearby. I remember driving his car and then dropping him off out front of the bakery due to how lousy the parking is at that plaza. As I’m driving around doing loser laps, my brother, who was in the car with me, yells out, “Alex Smith jersey! !” I legit almost crashed. I almost hit a car in front of me not knowing whether to break hard or hit the gas to find this jersey! I go past the car in front and circle around, hoping to find this rare sight of an Alex Smith Chiefs jersey in Miami. Didn’t see a thing, so I asked my brother, “Are you sure you saw it?” He said, “Yes! Trust me.” I kept circling around and then BAM! Not only did I see an Alex Smith jersey, it was a trio of Alex Smith jerseys! It was a family of Chiefs fans! So, here we are in 2018. I’m still at #7 in meeting live, up- close and personal Chiefs fans interactions. It’s been a rough road, but recently through the encouragement of others, I’m finally making a push to change this sad state of affairs I’ve experienced the last 25 years as a KC fan in South Florida. I’m actually in the process of aiming to go take a trip to the motherland of sports for me… ARROWHEAD! The target goal is the home opener vs. the 49ers (ironic eh?) on Sept 23rd. 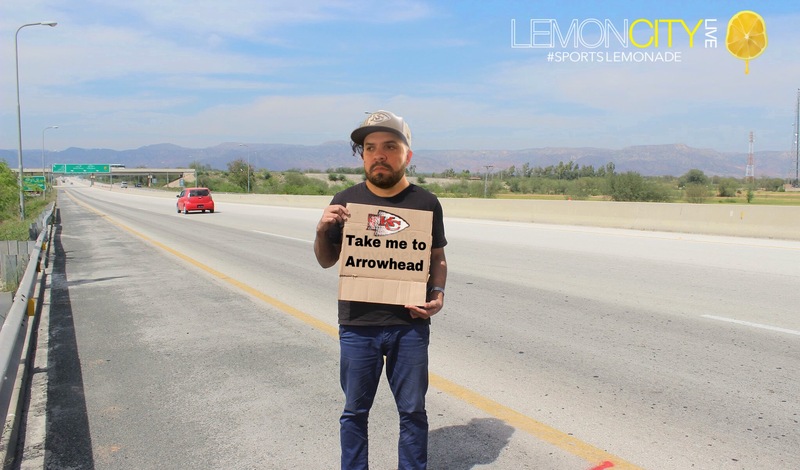 Not sure who will accompany me, or the X’s and O’s of the trip but I CAN tell you, I will be hugging a whole bunch of strangers that day at Arrowhead. There will be a lot of photos taken of not just the stadium but of me hanging out with other Chiefs fans. All I could think of is Rudy’s dad in the movie Rudy entering the Notre Dame stadium for the first time. That’s going to be me. Filled with so many emotions. I totally already anticipate the tears. I’ve looked forward to that moment for so long, so why not take this LONG overdue trip to Arrowhead on my 25th anniversary of being a KC fan!? It’s gotta be done, and it will get done somehow, someway. Kansas City, the lone Miami fan WILL be there soon! Young Chris working on his fantasy skills from an early age. Global Soccer Icon Ronaldinho Partners with Pro Footvolley Tour!